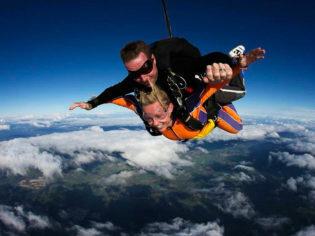 Megan (attached to Glenn) falling through the clouds back down to Margaret River. Megan Arkinstall discovers a wilder side to Margaret River: by air, land and sea. We are just about to touch down at Perth airport, where we will pick up a hire car for the drive down to the Margaret River region for a few days away from the daily grind. But rather than feeling excited, my palms are sweaty and I have butterflies in my tummy. In fact, I think, I may as well just jump out of this plane right now, because in approximately four hours this is exactly what I will be doing anyway. And. I. Am. Terrified. I decide to stay buckled up for now, and instead fret the whole drive to Busselton Regional Airport, 240 kilometres south of Perth and 50 kilometres north of Margaret River, where Skydive Geronimo HQ is located. “It’ll be awesome!” customer service coordinator Lucy exclaims, as she and my husband over-animatedly fist pump the air. Their shared enthusiasm does nothing for my nerves. Megan moments after ‘the jump’. After a short video, we suit up in prisoner-orange suits and meet our instructors – Glenn, the owner, and Grant – who give us a safety briefing. The whole pre-jump process is going along rather quickly (a little too quickly for my liking) but, both Glenn and Grant have jumped over 15,000 times each, so it’s fair to assume they know what they’re doing. We have a choice of altitude: 10,000, 14,000 or 15,000 feet. The higher you go, the longer you free-fall. Dare-devil husband insists on the 15,000-foot drop, which is a whole 66 seconds of freefall. There’s no turning back now; we are headed for the clouds in the GA8 Airvan. Below us is stunning Geographe Bay; long stretches of white sand and jade green water; the verdant patchwork landscape of WA’s famous south-west wine region in the distance. This is what makes a jump with Skydive Geronimo so special – location, location, location (plus a 100 per cent safety record and super friendly service don’t go astray either). Before we know it, with a check of the altitude watch, the plane door is open. Jake (the cameraman) has swung out the door and is casually hanging off the side of the plane to get some footage. My husband and Grant edge towards the door and within a few moments, they are gone – disappeared into thin air. Holy Mother of Sheer Terror, it’s my turn. All sorts of profanities escape my mouth as we shuffle forward. I feel the rush of cold air; the sound is deafening. Every ounce of my being tells me this is a rather reckless thing to do, but I have no choice at this point – Glenn has swivelled my body out the door, my legs are hanging in mid-air under the plane, my head is back… And then we drop. Our bodies tumble quickly; I can’t see what’s happening or where we’re headed – it’s all rushing past me in a blur. But soon enough we straighten up and are face first into the strong wind and white, cool clouds. It’s an unreal feeling – like we are floating, not falling, and everything is rushing past us at 200 kilometres per hour (and by everything, I mean the clouds, flashes of my life, and other such nothingness). I find it a little hard to breathe, like you would if you were to put your head out of a fast-moving car window, but I manage to smile for Jake, who is somersaulting and gliding around us, snapping shots like it’s another day at the office. We come through one last set of clouds and I see sprawling Busselton below me; then suddenly a jolt and we are captured by our parachute. Instant elation spreads through my body. I did it! For the next few minutes we take in the view as we float towards the beach where we will land (Skydive Geronimo is one of only two companies in WA who land on the beach – beats landing in a nondescript field of grass). In complete contrast to how I was feeling five minutes ago, it’s so peaceful. The two-kilometre-long Busselton jetty (the longest wooden jetty in the Southern Hemisphere) is in full view; pristine white sand; shades of blue and green water; no high-rises as far as the eye can see. I’m not sure if it was the thrill of the jump or the simple fact that we survived – either way, my heart is pumping and I am ecstatic. We enjoy a celebratory drink at the Goose Café, adjacent to the jetty, which before long is back-dropped by a gorgeous west-coast sunset. We clink our glasses and toast to survival. I sit up straight, heels down, arms relaxed and look to Paul for approval. “You’ve done this before, haven’t you?,” he asks. Well yes, I have… not for at least 10 years but I’m confident it will be like riding a bike. My husband on the other hand looks uncomfortably awkward on top of his horse, Biscuit. I can’t stifle my giggles as Paul instructs him on how to sit a little more gracefully. Megan with Paul out on the cattle farm. We are taking things down a few notches today (at least 194 kilometres down, in fact) with a Drover’s Tour at Jesters Flat, in Rosa Brook, 20 kilometres east of the Margaret River township. Owned by Paul and Fiona Brennan, Jesters Flat is a working equestrian farm and vineyard that operates several horse riding experiences through Margaret River bushland and neighbouring cattle farms. As we begin our ride, Paul tells us not to let the horses stop for a feed or “you’ll lose authority”. My horse, Jacko, is a handsome chestnut gelding and he does indeed decide to stop for a feed and I do indeed lose authority – so much for riding a bike. Luckily Paul is on hand to pull me out of a couple of tricky situations (like when Jacko decides it is time to go home). It’s the quintessential Australian scene: Paul leads us through the sheltered bushland, whilst Sprocket, his faithful dog, follows and provides much entertainment. We cross over into rolling acres of a neighbouring working cattle farm, where we ride amongst the cattle and watch Sprocket as he riles them up, dodges them and, when realising he is outnumbered, makes a run for home. Paul admits that some people find horse riding a bore when meandering along at a slow pace – but it doesn’t have to be, even for beginners. To add a little more adventure, he shows us how to pick up the pace to a trot. It takes us a few attempts (and, amusingly, some saddle soreness on my husband’s behalf), but eventually we’re trotting along side-by-side. Cantering comes more naturally to me. As I find my rhythm, it’s somewhat therapeutic: the only sounds to be heard, apart from the fresh country air rushing past me, is Jacko’s hoofs pounding the earth. We head back to the cottage as the sun is setting, where a roaring outdoor fire takes the edge off the cooling temperature of the day’s end. Fiona leads us up to the treehouse, where we sample her warm homemade bread and dukka and cosy up, just like a pair of drovers, to the sounds of the bush. We are heading toward Rivermouth Beach today, 10 kilometres west of the Margaret River township. It’s chilly and I’m a little apprehensive about getting into the ocean. But when we meet Josh, from Josh Palmateer’s Surf Academy, his enthusiasm is palpable. So, I strip to my swimmers, pop on an already wet wetsuit (eek!) and follow Josh down to the waves dragging behind me my huge grommet-like mal. Some beach safety first before Megan heads out. He grabs my board and heads straight back out – no rest for the wicked here. Spinning it around, I jump back on as he counts down to my next attempt. I repeat his tips in my head: feet wide, lean forward, knees bended and feel determination sweep through me. I push myself up, take a few moments to steady my jelly-like legs and, with arms flailing to keep balance, I stand! I ride the wave in toward my husband who is cheering and I raise my arms in triumph. Josh is just as thrilled, “Whoo hoo!,” he yells from behind. I can see how this becomes addictive. I grab my board and head straight back out to once again feel the euphoria that comes with riding a wave. I emerge an hour later with a wide goofy grin across my face with some not-so-goofy surfing experience under my belt. Now, after satisfying my appetite for adventure, I have a roaring hunger – perhaps it’s finally time to head to those vineyards. Skydive Geronimo: From $339 per person for a 10,000-foot tandem skydive experience. Hangar 6, Airport Drive, Busselton 1300 449 669. Jesters Flat: From $80 per person for a 1.5-hour Drover’s Tour, 1549 Rosa Brook Rd, Margaret River, 08 9757 4562. Josh Palmateer’s Surf Academy: From $50 per person to join a group or $130 for a private lesson. (Ask about the free pick-up service or meet at Rivermouth carpark), 08 9757 3850 or 0418 958 264. Sun setting at Busselton Jetty. Willy Bay Resort: Willy Bay Resort sits amid 75 acres of natural parkland, overlooking a lake and vineyards. The resort is close to the Margaret River township and is made up of 10 modern self-contained chalets, each with two bedrooms, a gas log fire, marble flooring, full kitchen, spa bath and flat-screen televisions. From $224 a night. Margarets Beach Resort: This is Margaret River’s only resort by the sea, located only 500 metres from Gnarabup Beach. It offers one- and two-bedroom apartments with views of the coast, pool or gardens and is a fantastic family option with a swimming pool, children’s playground, bike hire (there are beachfront cycle tracks), a restaurant and very friendly service. From $180 per night (minimum nights apply). Larder in Margaret River offers deliciously fresh home-cooked meals to takeaway – a fantastic option if you have kitchen facilities at your accommodation.